Shenandoah Valley Organic was founded by a life-long farmer who wanted to revolutionize the poultry industry—the rapid growth of our Farmer Focus brand chicken reflects the demands of conscious consumers. VISIT US AT BOOTH #127 TO SAMPLE OUR DELICIOUS CHICKEN! AND ENTER TO WIN A FARMER FOCUS PRIZE PACK! 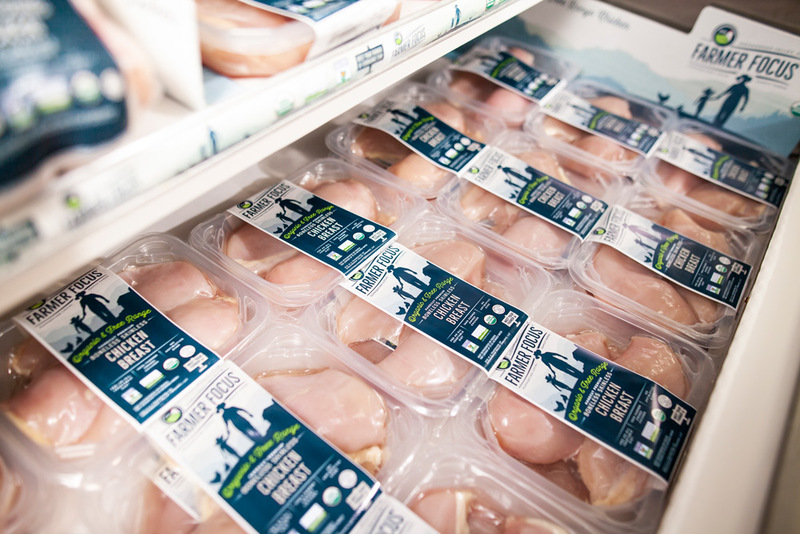 Farmer Focus Organic & Free-Range Chicken is packaged in an EZ open, leak proof, recyclable, vacuum-skin pack tray, with award winning design, and innovative Farm ID source verification on every product. Every one of our farms are certified by USDA Organic, non-GMO, Certified Humane, and Global Animal Partnership Step 3. Every feed lot is inspected by the non-GMO project. Shenandoah Valley Organic has a full line of fresh chicken products, including a pre-seasoned line: garlic and herb whole birds, lemon pepper boneless skinless breasts, and teriyaki flavor boneless skinless thighs. Great product with excellent product mix, long shelf life and beautiful packaging. When we brought in Farmer Focus, we were able to increase sales over 50% compared to previous years. The product line has elevated the fresh meat case to a point where we are now a destination for fresh organic poultry. In fact, we have many new customers who are now shopping with us because of it. Our new line of value-add items are on the way! Our high-protein bone broths are not-from-concentrate, and our fully-cooked chicken meatballs and sausages are perfect for meals on the go. Thank You for your interest in Farmer Focus Chicken! If you would like to learn more, request a meeting with one of our sales reps, or email us at info@svorganic.com. Connect with us on social media for the newest recipes, farmer features, and more!